With support from the National Science Foundation, the central goal and purpose of this website is to begin to draw together a community of researchers, designers, and practitioners to build capacity for a new genre of learning and teaching called Learning on the Move (LOM). The images above illustrate just a few efforts to begin to develop learning on the move. These efforts use mobility as both the content and process of learning. These efforts focus on how people use their bodies, new mobile technologies and digital mapping tools (e.g., location-aware technologies, Mapbox, Carto), designed and natural environments, and/or smart and connected communities to learn and teach in innovative ways. Likewise, they also draw our attention to how representations of mobility influence how we see and understand the role of mobility in varied cultural activities. 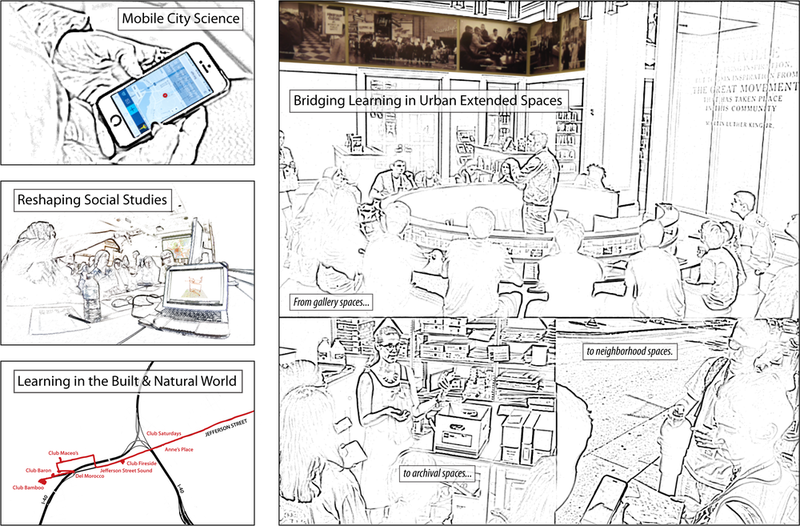 Learning on the move aims to raise and address new types of research and design questions including: What are generative arrangements of new and “forgotten” technologies for promoting and capturing mobility in learning and teaching designs? How is mobility, as a cultural construct, taken up differently by cooperating stakeholders? How do different scales of mobility (i.e., embodied to global) inform (or contradict) perspectives on “teachable” phenomena? What are the perspectival shifts in one’s learning experience by using mobility as educational content? How do people benefit from and inform the development of “smart and connected” communities and cities through studying and sharing their personal mobility through the city? What is the relationship between mobility and identity in learning and teaching arrangements? Explore this expanding website and submit your own work to the examples, readings, and resources pages in order to grow a learning on the move "meshwork" that can support new collaborations, learning environments, and theories that advance how we live, learn, and teach.